So I haven’t talked about it on the blog as yet, but this past year I got my very first tattoo! I had been wanting one for years; but as an overly cautious person, I took my time making my decision. Even when I decided that I definitely wanted it (after years of consideration), I still gave myself one extra year to be certain. I told myself, if you still want this in a year, then go for it! So that’s what I did! I knew that for my first tattoo I wanted one person, in particular, to be with me. And no…it wasn’t my husband! When I was in my early teens, I was spending the summer in Dublin and had gone with my brother’s partner to get one of his tattoos. So I always had that special memory of Robie and myself doing something together. I knew that when it was my turn, I wanted him (the only person in my immediate family to have a tattoo) to be with me and share another special moment together. I also knew that I wanted to do it in Ireland, which I consider my home away from home. Lastly, I really wanted a badass chick to be my tattoo artist, because….girl power! So the year before I actually got my ink, I started researching tattoo artists in Dublin. 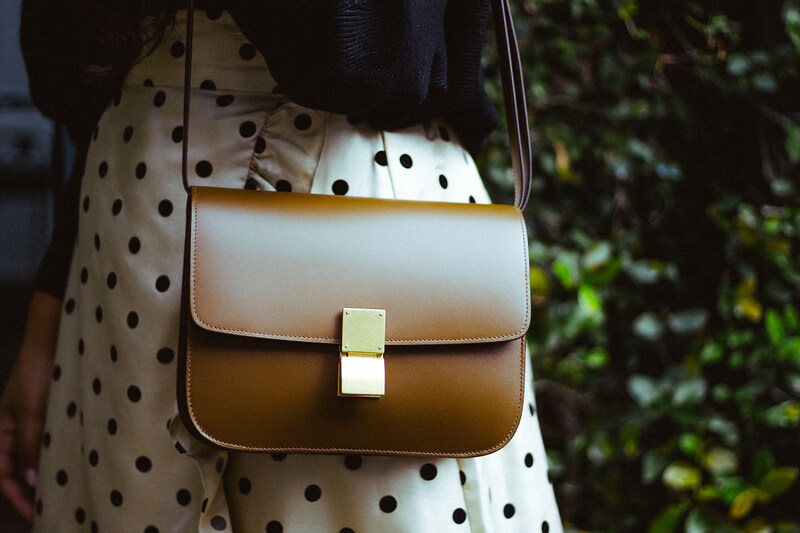 I stumbled across Niamh Coughlin who is incredible, and I thought could really capture the dainty design I was looking for. I messaged Niamh while on last year’s trip, and she was able to squeeze me in. In all honesty, I messaged her last minute because I wanted to give myself the out (I was being a total chicken) if she couldn’t fit me into her schedule. But, alas…she did! So here’s the good part….what I got! Well, ever since I was an art history student in high-school, the term “Flâneur” stood out to me. In the 19th century Paris, the term referred to a man who wandered or strolled around Paris observing the life of the city. Originally coined by Baudelaire, the term refers to a person who isn’t walking to get from one place to the next, but rather truly experiencing their surroundings and culture. Of course the landscape of France during this time as a hub for leisure, fashion and design also resonate with me. When I studied art history in college, I truly began to love the term started to adopt this stance of experiencing life and modernity as a sort of personal mantra. I hope to not just rush through life from one experience to the next, but instead relish in the now, my surroundings, where I’ve been and not necessarily knowing where I might go. 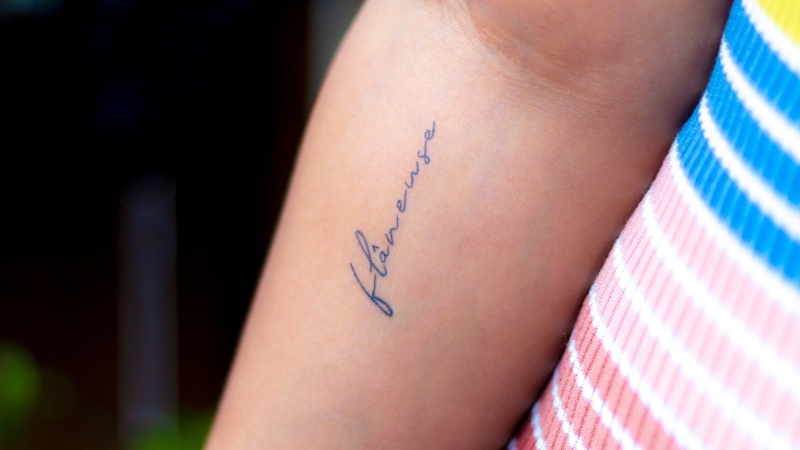 Of course, I had to update the masculine term to feminine – “Flâneuse” which is what my actual tattoo says. And there you have it… a little peek into the window of my psyche, what matters to me, and how I view the world. 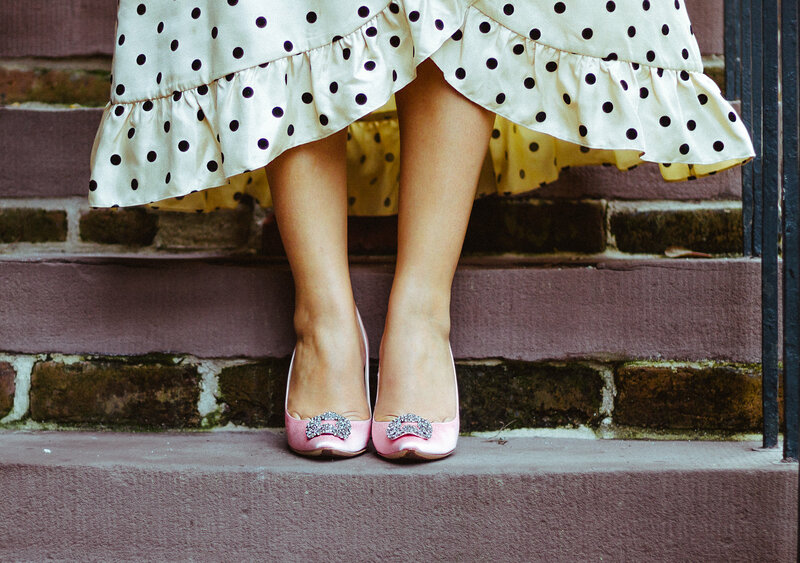 What about you, dolls? 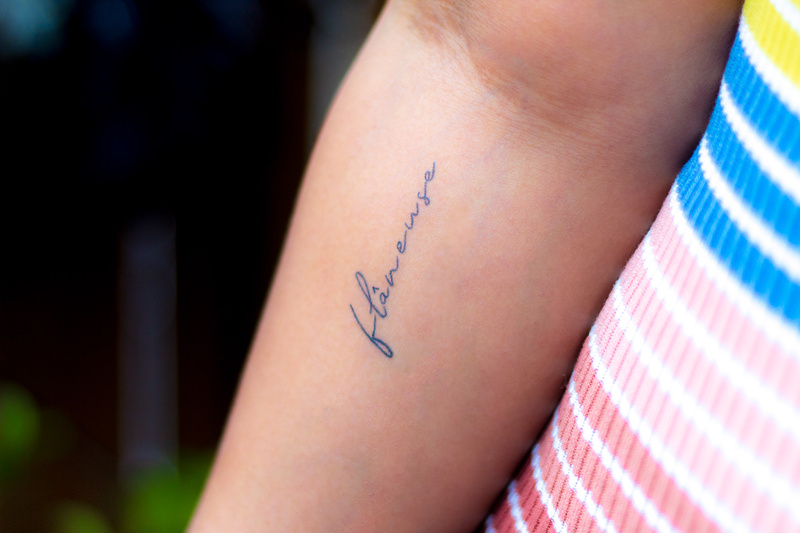 Do you have any meaningful words that you carry with you – tattoo or not? Tell me about them in the comments below or on social media! 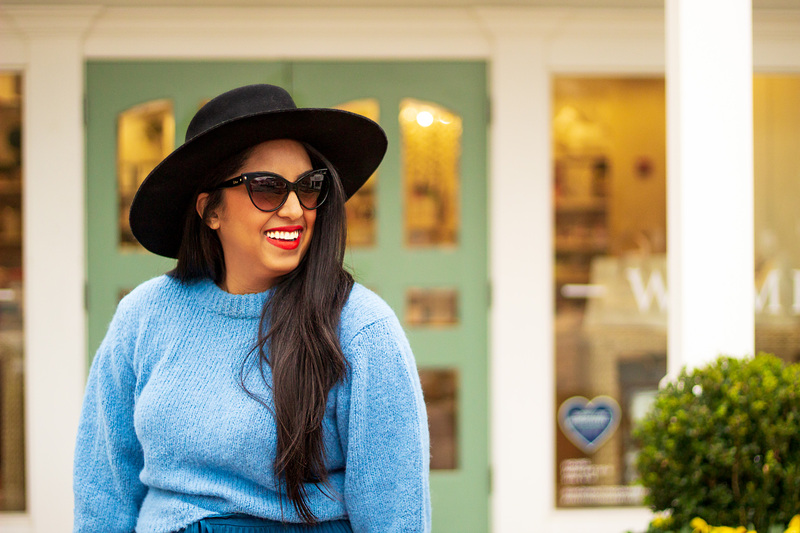 Last year, I showcased one of my favorite color schemes to wear in the dead of Winter: January Blues. So this year, I thought it was only appropriate to update the look for 2019! Again, I looked at one of my favorite designers…Tibi! 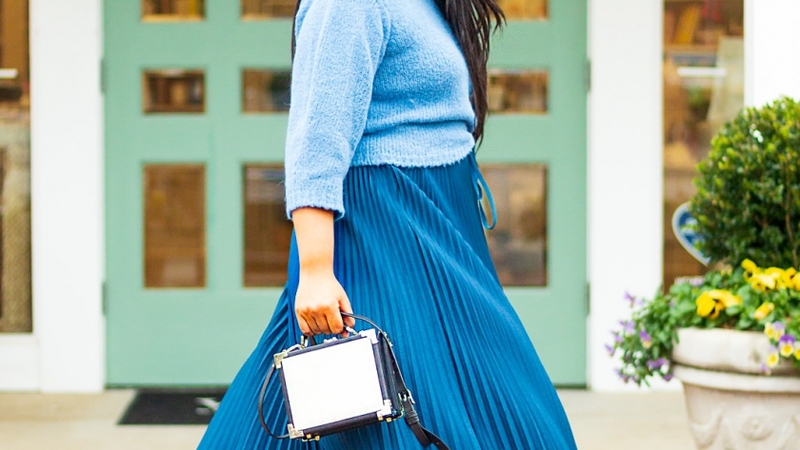 A pleated midi skirt and a matching sweater is a ladylike combo that I love to wear to work and off-duty. 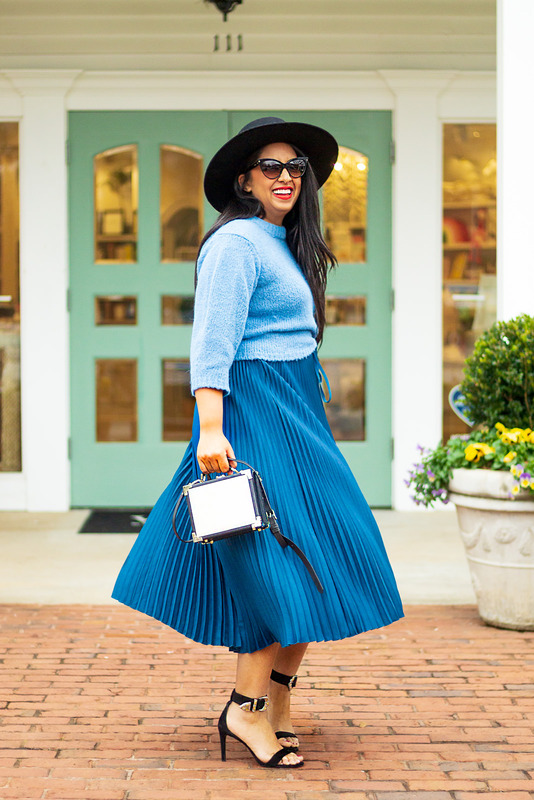 I especially love the shade of this blue, because of the skirt trends more on a rich teal that pairs well with other jewel tones. 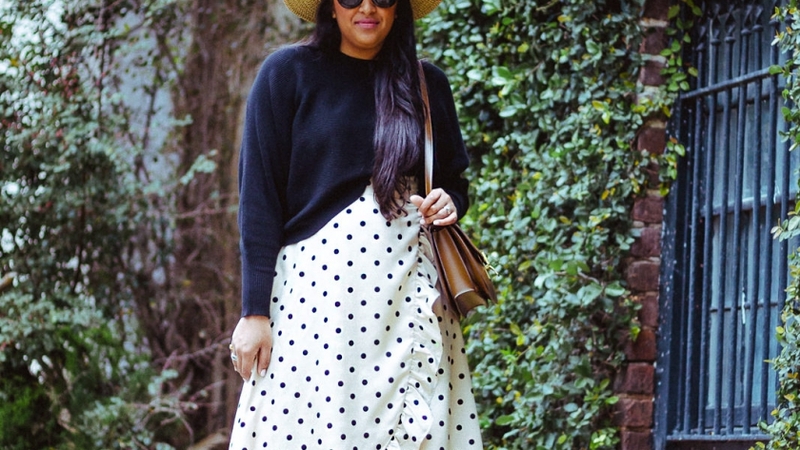 The sweater has exaggerated sleeves that makes it more fashion-forward. 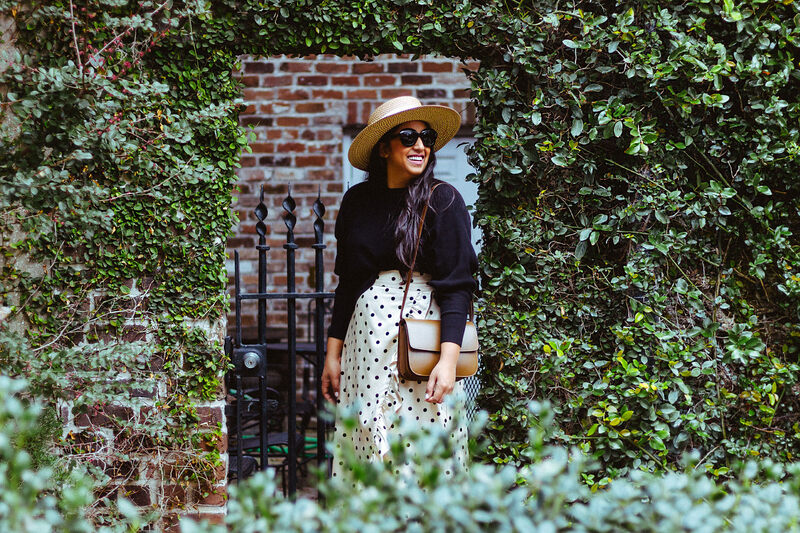 To complete my look, I added some of my favorite accessories: an oversized rancher hat from Lack of Color and suede sandals from Maje that I picked up in Barcelona. All of the pieces are linked below! 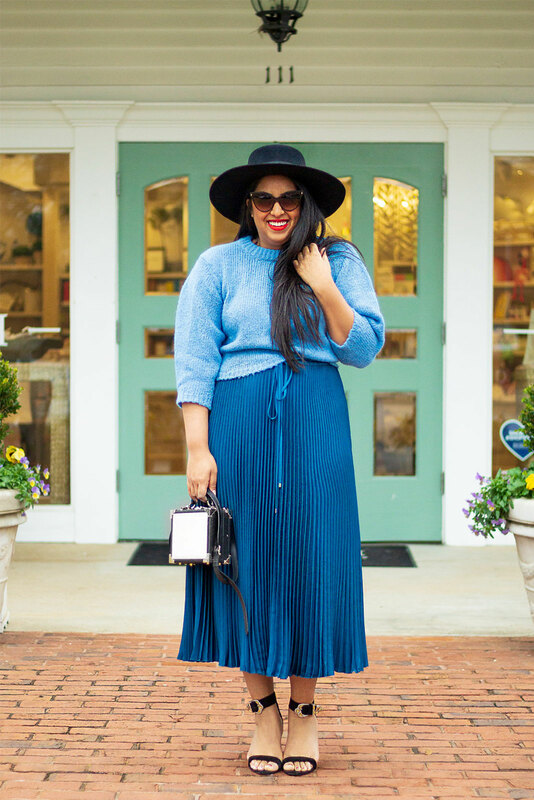 Sweater: Tibi. 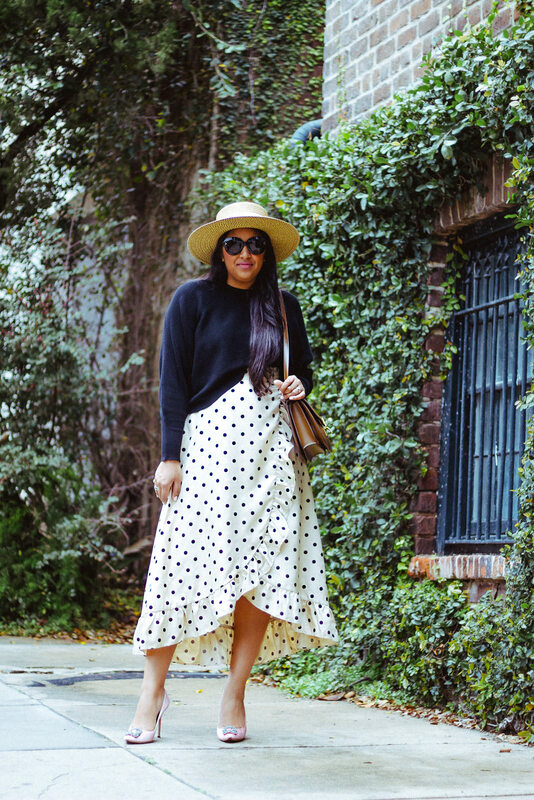 Skirt: Tibi. 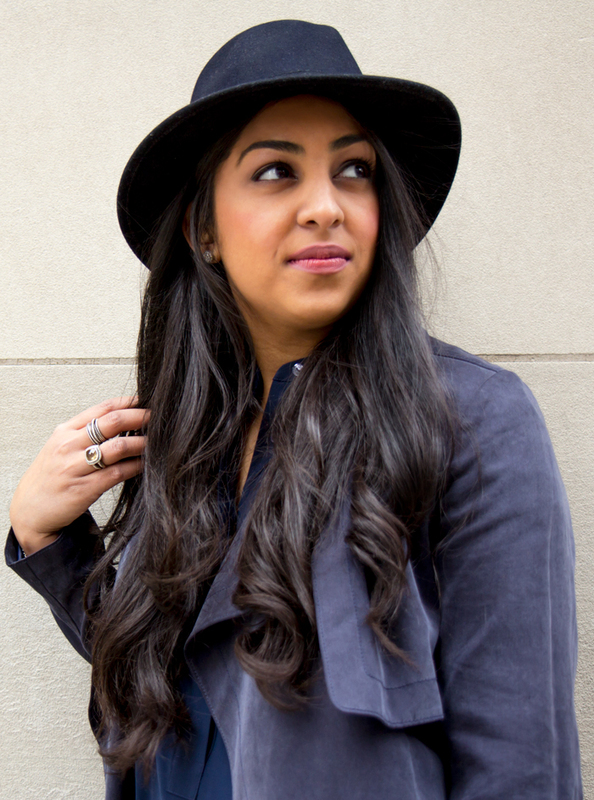 Hat: Lack of Color. 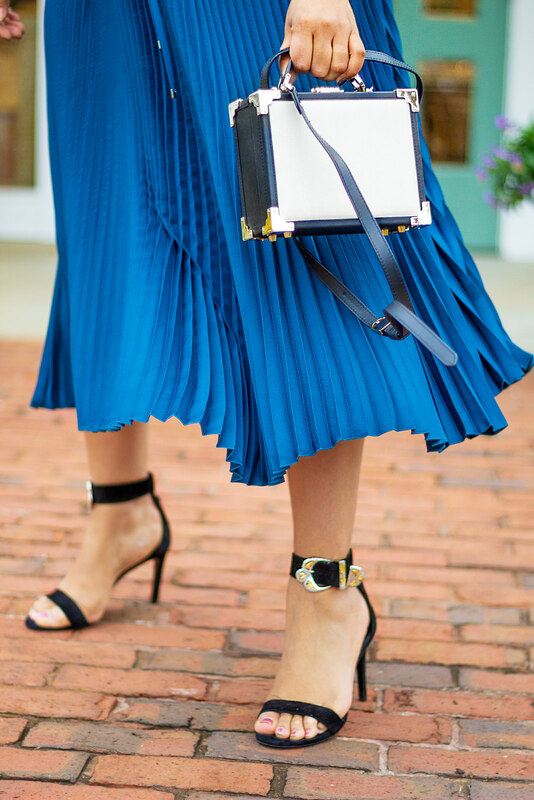 Sandals: Maje (50% off!). 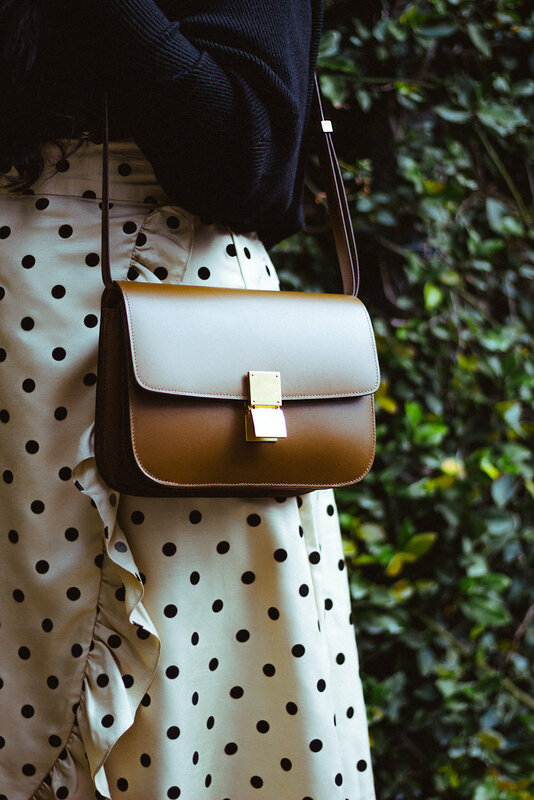 Clutch: Aspinal of London.